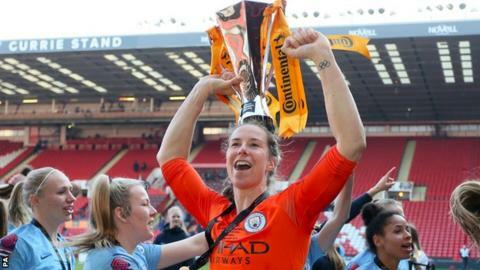 After her penalty shootout heroics helped Manchester City win the Women's Continental League Cup, England keeper Karen Bardsley reminded people not to write her off. The 34-year-old - previously the outright number one for club and country - has faced competition to start recently. But she saved two Arsenal penalties as City won the shootout 4-2 to lift the trophy for a third time. Bardsley is part of the England squad for the SheBelieves Cup in the United States, starting on Wednesday. "There are no two ways about it - I'm getting older, so I can't play forever," she told BBC Sport. "It's obvious the club do need a succession plan, whenever that time does come, but by no means can anybody write me off." The veteran stopper - who helped England reach the semi-finals of the past two major international tournaments - has battled for the number one shirt at City with 19-year-old Ellie Roebuck for the past two seasons, but Bardsley was preferred in goal for Saturday's final at Bramall Lane. Both keepers could still yet feature for the Lionesses at this summer's Women's World Cup, which begins in France on 7 June. "Karen's situation is evolving in the sense that she was the England and Manchester City number one and played every game," Man City boss Nick Cushing told BBC Sport. "Now she's competing for the shirt with England and she's competing for the shirt for Manchester City. But she shows her strength of character and her ability to be a big keeper in big moments. "She's an incredible goalkeeper, an incredible person, and has helped us win another trophy. "It's not for me to select the England team but I know that, when we play KB in big games, she comes up with big moments. She helps you to win trophies." England and City skipper Steph Houghton, who has now won the Women's Continental Cup six times in her career, added: "When it comes to penalties and the big moments, KB shows why she's world-class. "You always feel she's going to save at least one penalty." Women's Super League leaders City could go on to win a treble of trophies this term and they remain unbeaten in domestic competitions since last May. Cushing, whose side could have won Saturday's final in normal time but Nikita Parris and Janine Beckie both struck the woodwork, believes the win will have a positive impact on his side's league title hopes. "It will galvanise us. It gives us more confidence," he added. "It makes the players here that have never won trophies with Manchester City before, see what we're about They know now that if they play well and they contribute, they'll win medals." City's closest rivals in their bid to reclaim the WSL title are second-placed Arsenal, who are two points adrift in the WSL table but with two games in hand. And Cushing told BBC Radio 5 live's Sportsweek programme on Sunday morning: "It's their league to lose now." Gunners boss Joe Montemurro - who led the London club to success in last season's League Cup final over City - said he will ensure they get their injury-hit squad mentally ready for the title chase when the WSL resumes after the international break in March. "Now [the cup is over] we can be a little bit more calculated in the way we approach the title, getting everyone ready to win this thing," the Australian said. "We need to get them all mentality fresh and ready for the run home." Montemurro, who was only able to include star striker Vivianne Miedema from the substitutes bench on Saturday because of fatigue, admitted that he could not watch, as his side took part in a tense shootout in Sheffield after 120 goalless minutes. "I haven't watched the shootout. I turn my back. I never watch them," he said. "I went to them and said 'who's confident and ready?' And all of them said 'I want to take one'. "We had the huddle and we said this is now an Arsenal team that wants to work for each other, has a big heart and will back each other up to the end, to make sure that we get the success that we deserve to get, for the way they work." England's SheBelieves Cup campaign begins against Brazil on Wednesday, before fixtures against the USA and Japan on 2 and 5 March respectively.